Last year, I was given the special edition of Stan Sakai‘s Usagi Yojimbo. This is the kind of mixed gift when you are travelling around, as this box weights a few kilos. I put it in my shelves until I would have some time to read it. I have finished reading both volumes, and I can say this was a really cool gift. As the title 兎用心棒 usagi jōjimbō indicates, this is the story of a rabbit bodyguard. More precisely a ronin rabbit in some animalistic variation of the edo period. Interestingly, the drawing style of this comic is quite far from manga, instead it reminded me a lot of the style of Sergio Aragonés, which is hardly surprising as he collaborated with Stan Sakai. The are even a few guest appearances of main character of Aragonés: Groo the Barbarian. The similarities go beyond the drawing style: they share the same depiction style for combat scenes: chaotic and exuberant, but also graphical codes, for dead persons in particular. The general structure of stories, often starting and finishing on a misunderstanding is also similar. One notable difference is that Sakai does not go mad with crowds scenes like Aragonés does. While the drawing style is definitely western, the stories felt deeply japanese. This is a story about a ronin, the difficulty of reconciling honour with the turpitudes of everyday. More importantly this is a story about wandering, searching for one’s self, not being able to return back. The character is torn between the friends he has in the higher class and the unsavory types he shared the live with. The narration is full of far villages, bad weather, and you can feel the warmth of tea on a tatami after finding a welcoming place in the storm. The book made me long for Japan, Kurosawa movies and Otoko wa tsurai. In short, a very good comic which I heartily recommend, in particular if you have a soft spot for Japan. This entry was posted in Comics, English, General, Japan and tagged Aragonés, Edo, Groo, Ronin, Sakai, Samurai. 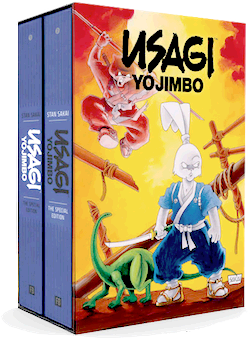 I read one volume of Usagi Yojimbo a long time ago and was not overly enthusiastic. Maybe the complete collection gives it a different feel.